We finally got the chance to meet the dudes AKA Stu and Guy behind 180 Nutrition Protein Powder at a recent Ancestral conference and wowee did we enjoy meeting them! Not only do they create amazing products they also super knowledgeable on the benefits of a real natural whole food lifestyle (they were presenters and we loved their session!). Ahhh, it was one of those talks where our heads got sore from nodding in agreement! Gotta love that! They are also both really nice… and we love nice people! We also loved hearing about how 180 Nutrition came about. About 8 years ago Guy was a fully qualified fitness trainer working at the University of Technology Sydney (UTS) however through his own research he realised the nutritional advice he was taught (along with everyone else) wasn’t adding up. Working in this environment, Guy recognised and witnessed the positive effects from a real food diet (yes, cutting out packaged food, grains and sugar!). He also realised how hard it was to find a natural healthy protein supplement that actually tasted good! YAY for brain waves moments like this! See… good story that one! So now, let us get to the delicious (and nutritious) part. The protein powder! 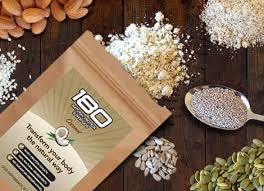 180 Natural Protein Superfood is made with 100% natural ingredients that have been carefully selected in consultation with leading Naturopaths, Nutritionists and International Health and Fitness experts. Not an industrial chemist in sight! Not only is this protein powder awesome to shake and blend in to delicious healthy nourishing smoothies it’s also perfect to add to drool worthy healthy baked goods, porridge (in fact, there’s a choc protein porridge recipe featured in our hard copy book!) 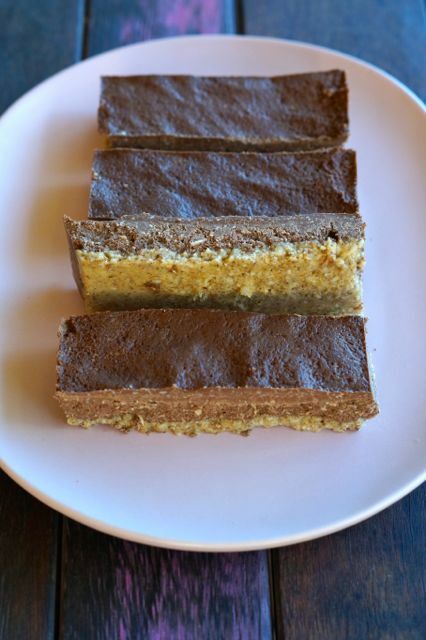 and raw treats… just like this 180 Nutrition Protein Chocolate Slice! Hope you like it! Wait… we’re pretty sure you’re going to LOVE it! Line the base of a 20 x 20 cm (8 inch) square tin with baking paper or use a silicone mould. Transfer the base in to the cake tin, making sure it's even, covering the entire base. Take the base out of the freezer and transfer the filling on top of the base. 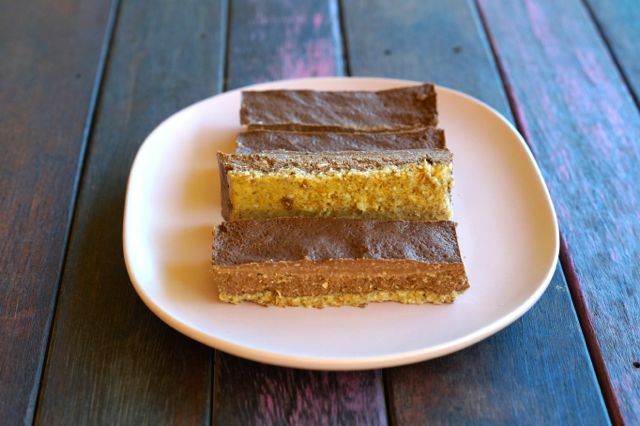 Spread out evenly and place the cake in to the fridge for around 1 1/2 hours or until set. Carefully turn out the slice from the silicone mould (if your using a metal tin, you may need to heat the edges with a warm cloth). If you don't have any protein powder swap for any nut meal and add a little bit more cacao powder! 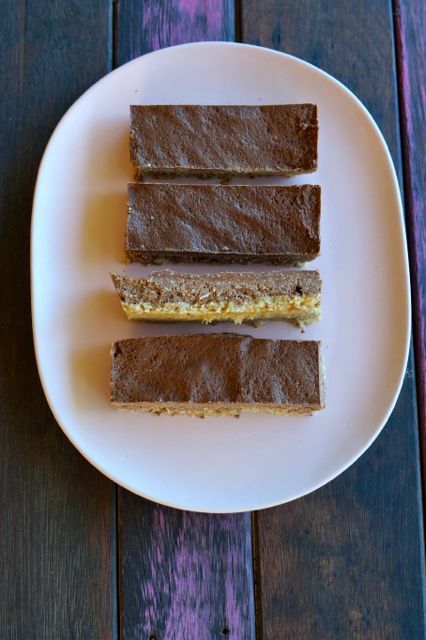 *We developed this delish recipe in collaboration with 180 Nutrition! Thank you AMAZING 180 Nutrition Team for helping to bring our hard copy book: Make It Merry to life! For further info on our blog sponsorship click here.